I haven’t been to Paris since last autumn and when I switched Insead campus and moved from France to Singapore. I never realized I was going to miss this city so much. This chance to see it again made me very happy and unhappy at the same time. Just one day, which I had to scrape out of flights and sleepless nights was so unbelievably, ridiculously short. I could spend months in this city. I needed so much to get a cup of chocolate at Angelina, a piece of warm tarte tatin at L’Ebuillante, get a box of macarons at Pierre Herme, have a warm breakfast scone at Rose bakery. There were so many ingredients waiting for me at G. Detou. I didn’t get any of these, but I’m grateful. I got something else. 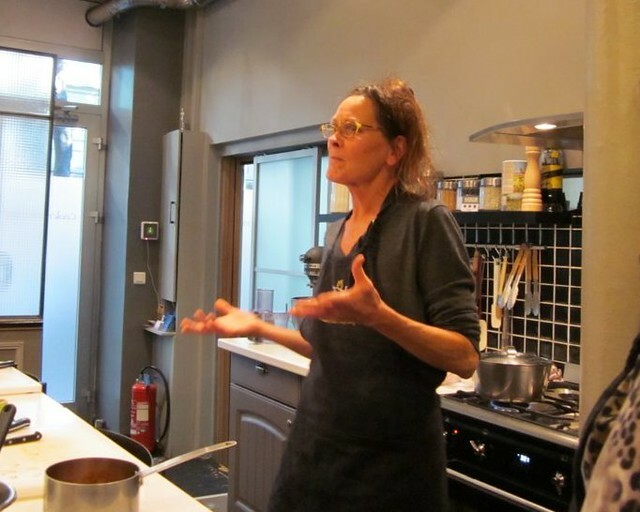 It was my very first thought when I found that I was travelling to Paris – I needed to book a weekend cooking class as soon as possible, if there was still something available. Le Cordon Bleu was fully booked already, so I resorted to David Lebovitz guide to Paris cooking schools. I really appreciate his Paris guides, e.g. this one Paris hot chocolate address book is also unbelievable. I went through his impressing list with very low hit rate - due to my last moment situation and my English language requirement, but I got lucky with Cook’n with class. They were offering an Organic Vegetarian cooking class with Terresa. I got immediately interested by her website and blog about living organic in Paris, about the inspiration she gets from beautiful vegetables and natural wines. The class started at 9 a.m. from the market tour at the subway station named Rome and it did without me. Something was wrong with my alarm and I opened my eyes at 8.57 a.m. being in a completely different part of Paris. I did my best to get myself together as quickly as possible and jumped into a taxi. Terresa welcomed me in, saying she was sorry for my missing the market, and helped me to get into the flow. Apparently I was on time for the cooking part, so I put on an apron and calmed myself down. The group included 6 people (the school doesn’t do more per class) from Europe and the US. We were going to cook a three course vegetarian meal from organic only products. The first was fresh parsley salad with roasted nuts, sweet peppers and apples. The second (main course) was quinoa cakes with three delicious toppings (eggplant, tomato and olive oil with basil and lemon zest). Finally - and almond blancmange with honey roasted fig. Terresa was already placing red bell peppers (for the salad) and eggplants (for the main course) on roasting trays using no oil. “These (she was pointing to eggplants) need to really blacken”. To the point when the skin turns into black crust. Then the inside will become white and smoky. To prevent the eggplants from bursting in the oven we made shallow cuts along their sides. The peppers needed less cooking, just to soften and get some black spots on their sides. Terresa was explaining a lot around ingredients and cooking techniques and I see there is no way for me to capture the whole depth of the class in one short post. At least I can hopefully express the amazing feeling it gave. All the food felt very special: the ingredients were extra fresh and flavorful, the recipes - original, simple and appealing. The veggies went into 240C oven for quite some time. From time to time Terresa was taking them out and turning gently – with her hands! She seemed to have no problem with the temperature. “Do use your hands in the kitchen. I think it’s so lady-like”. She was especially accurate with the peppers - not to break them. “I want to keep every little bit of their juice inside” - I was in love already. We moved to making almond milk for the dessert. I never made it before and I’m quite happy I tried it now. It turned out absolutely doable and fun to make. First the almonds needed peeling. “You can’t get organic almonds already peeled around here. And even if you did, they would already have lost most of their aroma”. We added several bitter almonds for stronger aroma and blended the nuts together with cold water till we got white mixture truly looking like real milk. For the next procedure Terresa chose two strongest members of the group. The milk got strained through a piece of cloth until every last drop of white liquid was squeezed out. The white almond mass was left inside the cloth. “In the kitchen I enjoy using up every last bit of good products. For example, at home I would dry this almond in low oven and use it afterwards as a breading, or as part of flour”. I’m not sure this would resonate with me if said by someone else, but Terresa was very powerful. She was treating the food with so much care and respect. I was completely with her at that moment. We heated the almond milk with some sugar and agar, poured it into individual crème brulee dishes and into the fridge it went to set. For the topping of the dessert we made deep cuts on the figs and opened them up a bit. Then we poured some honey into the middle of each fig and added a bit of fresh rosemary. While roasting in their individual dishes the figs gave out lots of juice, which mixed with the honey into beautiful syrup. That was a moment when we deserved a break - Terresa set us down for a glass of wine with cheese and bread. That was my first chance to taste natural wine, organic wine produced based on the old traditional technologies. I'm not somebody who understands a lot about wine, but this was something very different from what I tried before. It was full of light and freshness and went most perfectly with the goat camembert and amazing bread, especially the darker one with walnuts. Terresa explained how to go about cutting cheese. The round shaped cheese is a pie - one has to cut it in sectors, to get all the stages of ripeness in one piece and leave the opportunity for the others to do the same. The rectangular shaped cheese (Comté in our case) should be sliced lengthwise. After the break we had not too much left to do. For the quinoa cakes we washed the quinoa and cooked it in water under a lid for 15 minutes. Then we let it rest under a piece of thick cloth and flaked it with a fork. When it was cook enough we mixed in an egg, added some salt, grated parmesan lemon zest and juice. Quite a bit of lemon juice - quinoa absorbs things strongly and needs a lot to get flavored. We shaped the quinoa into individual cakes using a little baking cup brushed with olive oil and into the oven they went for some 20 minutes. Terresa was using French unrefined sea salt. It tasted good to me - mild and natural. It was interesting to find out that she doesn't at all like Maldon salt (which I love) for that it salts in a very aggressive way. Then we prepared three complements for the cakes. Eggplant puree, which we made of the roasted eggplants. We carefully skinned them, pureed stirring with a fork and dressed with salt, black pepper, balsamic vinegar, lemon juice and olive oil. For the roasted pepper sauce we skinned and deseeded the peppers and blended them with a fresh tomato. Finally we mixed some olive oil with lemon zest and fresh basil and let it stand a bit to get infused by the flavors. To make the salad we cut quite some amount of fresh parsley, some roasted peppers, fresh apple and slightly toasted sliced almonds. Terresa even showed the cutting techniques and explained how to sharpen knifes. The dressing already felt usual at that point: balsamic vinegar, olive oil, salt, freshly ground black pepper and lemon juice. We sat down. At that moment I had a feeling that we really deserved the food. The salad tasted fresh and colorful. Apple added a lot to the taste, peppers and almonds - to the raw appetizing texture. When the cakes were done and still hot we served them over eggplant puree and roasted pepper sauce and topped with the lemon and basil oil. 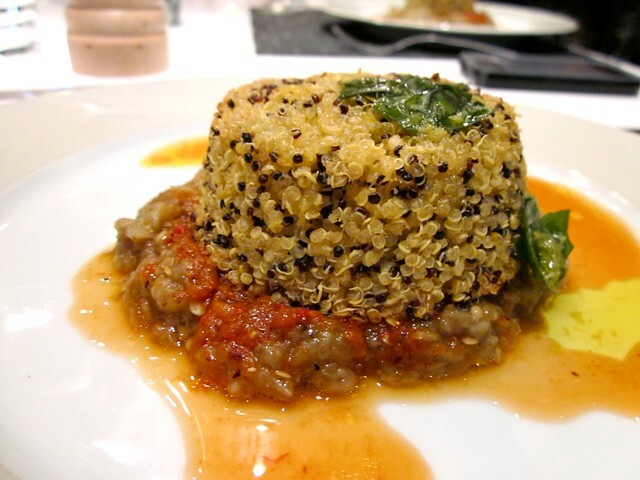 Quinoa was crisp at first bite, but then it disappeared immediately in your mouth and gave way to the silky eggplant and intense pepper, lemon and basil. I was amazed by this dish. The blancmange had already set, so we took it out of the fridge and flipped it onto the serving plates. 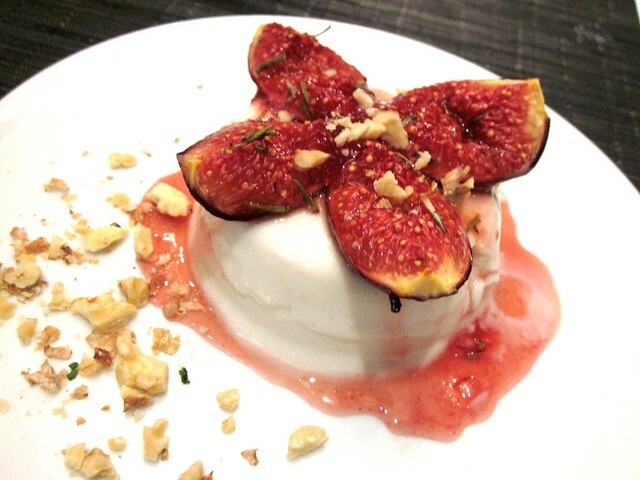 We placed a roasted figs together with the ruby honey syrup on top of each blancmange and sprinkled with toasted walnuts. If I still need to say something about the flavor, well, let me know. I just had to ask Terresa what she thought about Rose bakery. It is a famous Paris organic British bakery, which I love and which I frequented while living in France. "She is doing a great job" Terresa said - good to know! Now I'll definitely read the Breakfast, Lunch and Tea: The Many Little Meals of Rose Bakery and if you are ever in Paris - this place is so much worth your attention. Terresa was very kind to give me two suggestions for places to go for a friendly vegetarian dinner that day: Caffe dei Cioppi and Voy Alimento. Unfortunately I wasn't able to get a reservation with any of them for that evening, so I'm keeping them for my next visit. However instead I was lucky to visit L'Osteria, an amazing little Italian restaurant, which once contributed to Terresa's inspiration and which I'll shortly write about. That was the second time after the cook&taste class in Barcelona when I thought that the best food I get while traveling in Europe is in the schools. Can't believe I was hesitating whether I should pay the price for the class (which is quite impressing). Thank you so much Terresa for giving out this great inspiration. Please do keep me in mind in case you will need somebody to help you around for one of your next catering projects. Oh yes! Miss the cheese!! OH HOW!!!! It looks like a great time!